lasting building and countless repairs. With a variety of high-performance options available, Butler sets the standard in quality roof systems. The high-slope roof market is heavily residential and dominated primarily by asphalt shingles. Other materials used in high-slope applications include wood shakes and shingles, slate, tile, and standing-seam metal panels. Standing-seam metal roofs are more commonly used in the commercial market. 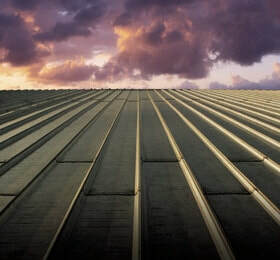 Low SlopeIdeal for commercial buildings such as warehouses, office buildings, schools, and retail centers, these roofs typically feature a slope of 3″ per foot or less. A growing number of new one- and two-story buildings in the United States use metal systems construction, and most use metal roofs. Through-fastened R-panel metal roofs, designed for low-slope applications, typically use 24- and 26-gauge coated steel panels. The panels are installed over structural support, being fastened at the sidelap and/or endlap joints. Designed for low-slope applications, standing-seam metal roofs use panels that are seamed together on-site. 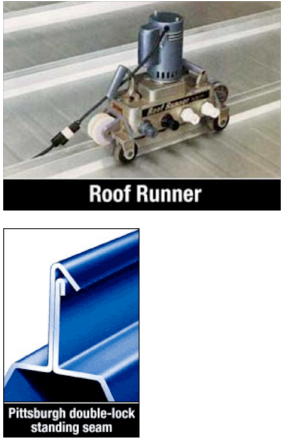 Butler uses a portable electric roll-forming machine (Roof Runner®) that bends the edges of connecting panels together to form a watertight seal. MR-24® roof system-the most specified standing-seam roof on the market and is specifically designed to accommodate roof movement. 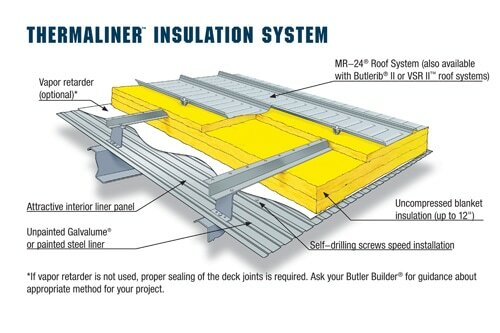 CMR-24® roof system-offers all the benefits of the MR-24® roof system, with the addition of a layer of rigid insulation board and an interior steel liner. Butlerib® II-engineered to be economical both to install and to maintain, the Butlerib® II roof offers features that make it the best through-fastened roof system in the industry. VSR™ roof system-a versatile standing-seam roof system designed exclusively for architectural applications. Snap-It™ architectural roof system-an easy-to-install snap-together architectural standing-seam metal roof system. The cost savings don't stop with just choosing a roofing system. Let Clear Span Structures enhance your roof system and maximize your building’s performance with these high-efficient options from Butler® Manufacturing. You simply cannot find better roofing solutions anywhere else. Choose a Butler® roofing system to retrofit your new or existing roof today and call Clear Span Structures for a free roofing estimate. We are your local Butler Builder®!